"Play keeps us vital and alive. It gives us an enthusiasm for life that is irreplaceable. Without it, life just doesn't taste good!" We are instinctively drawn to images of the face where the “movements of the Soul” are revealed. The mask-maker freezes a moment of this inner story revealing the dignity and timelessness of the human condition. Students will learn the fundamentals of designing and creating their own masks, focusing on sculptural techniques to capture the “essential spirit” of the mask and how to establish exaggerated expression and gesture. 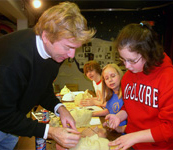 Participants will sculpt in clay, cast in paper-mache and learn painting techniques to give their masks maximum play. They will also explore the different uses of the mask throughout history. In this advanced class, students will learn how to create a neoprene latex mask. They will learn the ancient process of creating a plaster mold of their sculptures, which enables multiple copies to be made of the original. They will also continue to learn and refine sculptural and painting techniques to capture the “essential spirit” of their masks. Are you ready to re-discover your playful nature? Would you like to move more freely in your life? Would you like to delve into the delight of spontaneous creativity? Ready to laugh and gain insight? “Enter the Mask” to be your ticket to a day of creativity, insight, playfulness and wonder. “Enter the Mask” is an improvisation based mask workshop set in a safe and fun environment. Participants will explore the life, energy and art of masks. Mask work is a very unique modality of learning that inspires awe, wonder, and mystery in the mask-wearer, as well as the viewer. Mask work has traditionally been used as a means for actors to explore various characters. They have used masks as a means of unlocking stage presence stored in the actor’s body. During “Enter the Mask,” you will draw on this rich heritage of mask work and unlock more of your own LIFE PRESENCE residing in your body. You will walk away from this workshop feeling energized, more authentic and free. AND, this creative feeling will permeate your everyday activities. David will lead you on exploration of the different uses of masks throughout history. You will spend time in the masks, exploring movement, characterization, and voice. Committed to creating a safe and expansive environment, David limits the space to 16 participants. You can find out more about ages, cost, location, etc on the calendar. If you would like David to design and facilitate a workshop for your group or class, please contact him. “It was great! I thought I really wouldn’t enjoy it because I consider myself a “non-creative” person, but it seems that with the mask on I could open up to greater and more fun possibilities. "It was therapeutic. Normally in my life I operate within a safe range of emotions. This work gave me permission to go beyond this normal range and experience the wild man or woman inside in a safe place." "Connecting with this seldom experienced cast of characters within myself - and also seeing other participants' work from the audience expanded my ability to be more compassionate, I feel, for the different people I encounter in the world." "It was 10 times better than I expected. It was weird, exciting and exhilarating. I learned a lot to improve my professional and personal life. I will highly recommend the workshop to everyone." Theatre should be based not just on a well-trained speaking voice. A great actor fills the stage with their presence. For the actor, masks are an incredible learning tool to instill more expressive body language to their roles. Based on the theories of Jacques Lecoq, one of the most influential and pioneering teachers of theatre in the 20th century, this workshop is designed to unlock the presence and creativity that is stored in the actor’s body and thus enabling them to embody their characters more authentically on stage. Studentswill explore the different uses of masks throughout history, spend time in the mask, exploring movement, characterization, and voice, as well as create a short mask performance. I found the mask freeing and transformative. I felt a true stillness which surprised my expectations. The mask allowed me to access parts of myself which “non-masked” acting doesn’t seem to allow so readily (or at all).